Mobile devices, such as iPads, can roam freely from machine to machine, process to process without needing a specific machine configuration installed. Complete access to the display and it’s configuration is available from anywhere on the LAN or WAN using the savvy tools even when it is a third party PC display. The display is completely homogeneous in the system thereby eliminating potential data structure conflicts and communications issues. savvyPanel provides unprecedented flexibility in instrumentation, control and monitoring. Runs native on a savvyPanel station high resolution, touchscreen display. Extensive library of objects such as pushbuttons, switches, meters, indicators, lamps, buzzers, etc. Extensive library of graphical image “tiles” to build smart machine and process graphics. 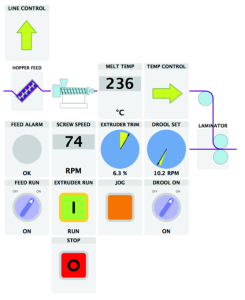 Machine graphic “tiles” can be linked to detail control screens. Full savvyPanel configuration is stored in drive.web devices for instant WiFi “roaming” access. Supports multiple screens with multiple pages. Provides hierarchical access to system groups, individual systems and multiple operator levels. 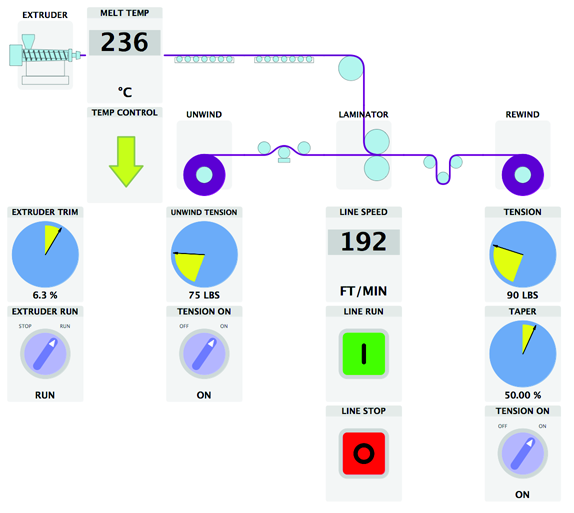 Easily build your graphics and controls and link them to any location in your drives or process control system. 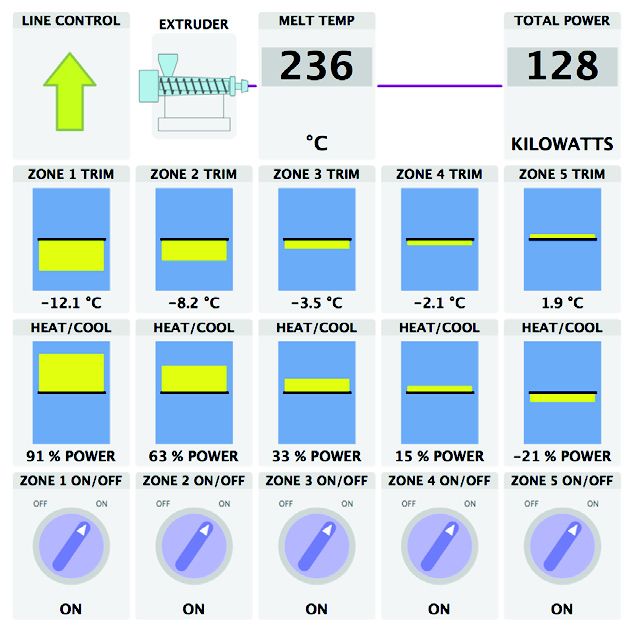 Touch an arrow link such as the “TEMP CONTROL” tile to drill down to the temperature control system. 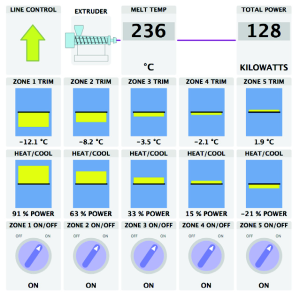 Touch the “MELT TEMP” tile in any screen to set the master temperature set point. No separate programming required. 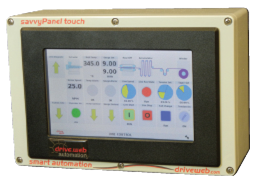 The savvyPanel touch display configuration resides in the drive.web drives or automation controllers. Everything is set up and accessed from the drive.web network using the intuitive savvy tools. 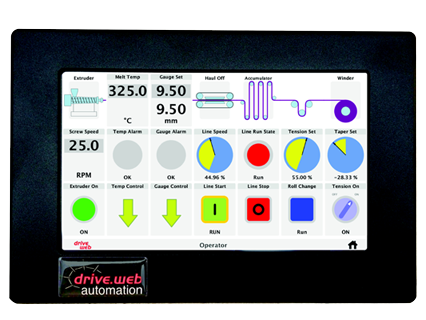 Connect directly to any single drive.web drive or automation controller. Impact resistant, flame retardant, polycarbonate industrial enclosure. NEMA 4 (IP65), light gray. Go mobile…get secure machine access anywhere! Download savvyPanel free from the Apple App Store and get immediate access to a real, live drive system in Stevensville, Maryland, USA.